Loved by our customers and healthcare professionals. Click to read. Made right here in the good ole U.S. of A. 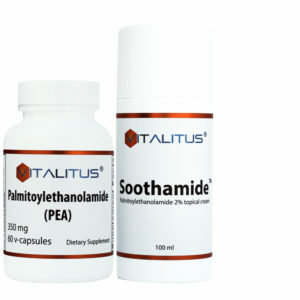 Get Palmitoylethanolamide Now or Bundle and SAVE! 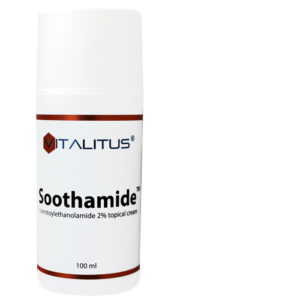 Get Soothamide Now or Bundle and SAVE! Patsy March 11, 2019 at 3:06 pm on Soothamide – PEA 2% Topical CreamExcellent product. I am combining this with oral PEA for shoulder bursitis. It really brought down the inflammation. Emily McGuire February 6, 2019 at 7:11 pm on PalmitoylethanolamideI started taking two pills once a day in late December, then two pills twice a day in early January. I have had problems with pain and swelling ever since I broke my wrist about a year ago. I was able to take a vacation in January, slogging through airports, zip-lining in Mexico, with many steps to climb at each tower, and be virtually pain-free. We did as well as the people in our small group that were 2/3 or 1/2 as old as us. This, despite having had years of chronic pain, muscle weakness and lack of stamina. If I forget and only take two once a day, my pain levels start getting worse. I would recommend this to anyone who has chronic pain and/or inflammation. Lily Weiss December 28, 2018 at 1:55 am on PalmitoylethanolamideI should add that my eye doctor Dr. Mark Wedul also suggested taking 6 fish oil capsules which I started doing. I am so grateful to him. Donald Pardy December 27, 2018 at 8:19 am on PalmitoylethanolamideThis is working for me! I had L5S1 disc surgery and was in a lot of pain months after surgery. It does take awhile to work. Thank you Vitalitus for making a much needed product here in North America I am grateful! I am from Canada and PEA is hard to get, I was ordering from the UK. Great Product easy fast delivery. 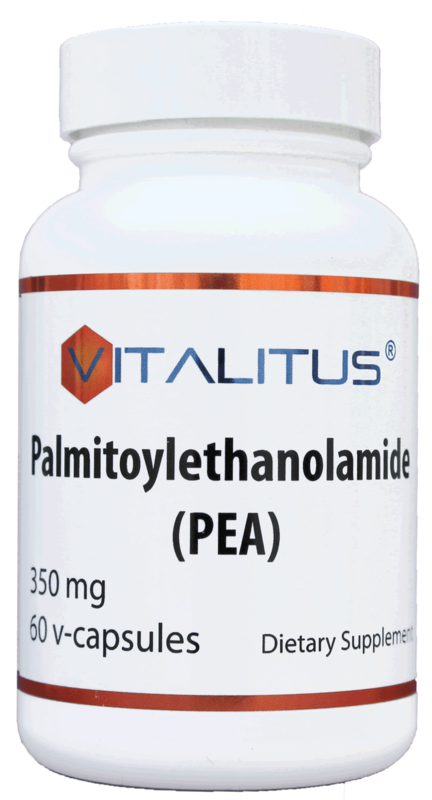 Lisa Albright December 20, 2018 at 10:25 am on PalmitoylethanolamideMy doctor recommended Vitalitus PEA to see if it might help reduce pain from Reynaud's syndrome. After taking 4 capsules a day for 6 weeks, I noticed no improvement with the Reynaud's, but that I was getting up in the morning, able to stand up straight without lower back pain. Also, I've been a candidate for knee replacements for two years now. Since I've been taking PEA, I'm am able to do most activities without any knee pain. Thank you, Eddy! 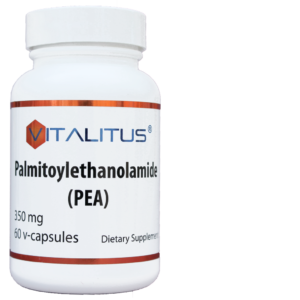 George Guerry December 12, 2018 at 11:05 am on PalmitoylethanolamideFound out about Vitalitus PEA from Nancy Sajben Md in San Diego. Duke said I needed a complete knee replacement due to severe osteoarthritis. Have been virtually pain free for more than two years taking Vitalitus PEA. Use it for "break through pain" with injuries. Also works for headaches-- just empty a capsule under my tongue and HA is much reduced in 10 minutes. Have used other products before Vitalitus, there's is far superior. Elizabeth December 6, 2018 at 11:09 am on PalmitoylethanolamideHuge sustained improvement in cognitive function within hours! Grateful PEA was recommended and is available is the USA. Joanne November 30, 2018 at 7:43 am on PalmitoylethanolamideSciatica nerve pain in hip and down one leg has been reduced at least 50%. However, have used several anti-inflammatory herbal supplements + fish oil in addition to the PEA. In the beginning I also used one NSAIDS (Cataflam) for a month or so. So these add-ons make it difficult to evaluate PEA alone. However, for now I have avoided cortisone injections and other invasive treatments and would give PEA a try in the future for a flare-up or for another inflammatory problem should it occur. Barbara Sarapas November 25, 2018 at 6:06 pm on PalmitoylethanolamideI've used Vitalitus PEA for a year for relief from chronic pain. After purchasing directly from Vitalitus, I read another review about using it sublingually. I have tried that and this way of using it increased efficacy by 50%, using only half a capsule. Since I will not use narcotics, I have found PEA to provide additional relief. I use it along with CBD oil and acetominiphen, as well as pain injections. I definitely recommend trying it. Leslie Kolhoff November 23, 2018 at 2:52 pm on PalmitoylethanolamideHad read about PEA in the national newsletter from the RSDSA - have RSD/CRPS and Sarcoidosis with osteoarthritis. Very painful. Myself, along with several others researched this around the world for weeks. Think I started taking PEA about five years ago. The glial cells were always thought to be useless, sitting depleted at the end of nerves and did nothing for helping pain. After my first 4 months of using PEA as a glial cell modulator my pain was reduced and my overall well-being was good. Zero side effects. In studying and researching I did stay initially on a 4 month course then dropped down to a maintenance dose. Have read where some folks will just not respond to PEA while others do. Either way after several years have not read of side effects from PEA. My docs did know I was taking PEA and were okay with this. There are two places I would buy PEA from and this site is one of them. Thank you. Dot November 22, 2018 at 7:59 pm on PalmitoylethanolamideI have a trapped nerve in the piriformis muscle and have had a great deal of sitting pain for a couple of years. There are days now when I have no pain. However, there are still some days when I have pain but not as bad as before. I find I am doing more activities and enjoying them. I have been taking it for 3 or 4 months. Vitalitus LLC November 20, 2018 at 2:16 pm on PalmitoylethanolamideEric, We recommend taking 4 capsules a day when first starting out (rather than only one or two) as a loading dose. Even then it might still take longer than a month to see results. Eric November 20, 2018 at 2:06 pm on PalmitoylethanolamideNo change in neuropathy after 4 weeks daily use. Jenny November 14, 2018 at 5:39 pm on Soothamide – PEA 2% Topical CreamMy disabled son rubs his skin a lot around his mouth area, causing redness and setting him up for an eczema type of reaction. I’ve used many products on his face. This one is doing a great job reducing redness, healing the skin inflammation, and protecting his skin. Quality ingredients. The Frankincense and Myrrh essential oils are very healing, along with the other ingredients. The PEA research seems to support its value also for inflammation. I would recommend it for skin inflammation. Sue Vanheel November 3, 2018 at 11:17 am on PalmitoylethanolamideI started using PEA for mast cell activation syndrome. It took a couple of months, but I now see a big difference in the pain in my back and knee. I will continue to use it and would recommend it to anyone with histamine intolerance, and many allergies that cause inflammation and associated pain. Shirla Reed October 18, 2018 at 12:36 pm on PalmitoylethanolamideDid not work for me. I’m happy to see all people it did help though. I have terrible thumb pain and can hardly write my name anymore. Andrea Brown October 8, 2018 at 11:24 am on PalmitoylethanolamideI have used PEA for a month & will continue taking it as it has helped Chronic Fatigue Immune Dysfunction Syndrome. There are several supplements my doctor has me taking & I continue the ones that help. This is a good one for me. 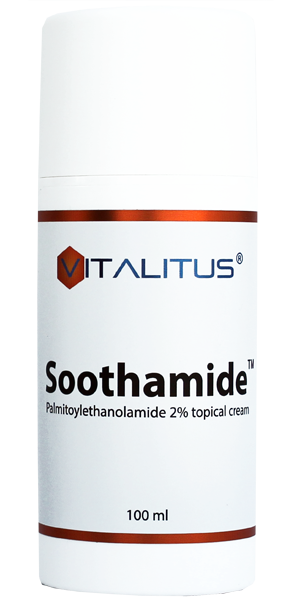 Robert Greener September 25, 2018 at 5:16 pm on PalmitoylethanolamideI am very please with my results from taking this product. I believe it has reduced the level of my chronic back pain. Also their customer service is very good. Jane September 12, 2018 at 8:10 pm on PalmitoylethanolamidePEA really seems to help my energy that had gone down so much. I believe it is helping my pain levels as well. So grateful. Paige August 30, 2018 at 3:16 pm on PalmitoylethanolamideSeems to help my CRPS and this product had the most research behind it. * Of course, everyone’s different and your results may vary. Our products may not be able to help everyone, especially if your issue is not gliopathic in nature. That said, we fully stand behind our products and offer an unconditional 100% money back guarantee if you’re not happy with your results. Vitalitus is a family-owned, BBB-Accredited, American company. 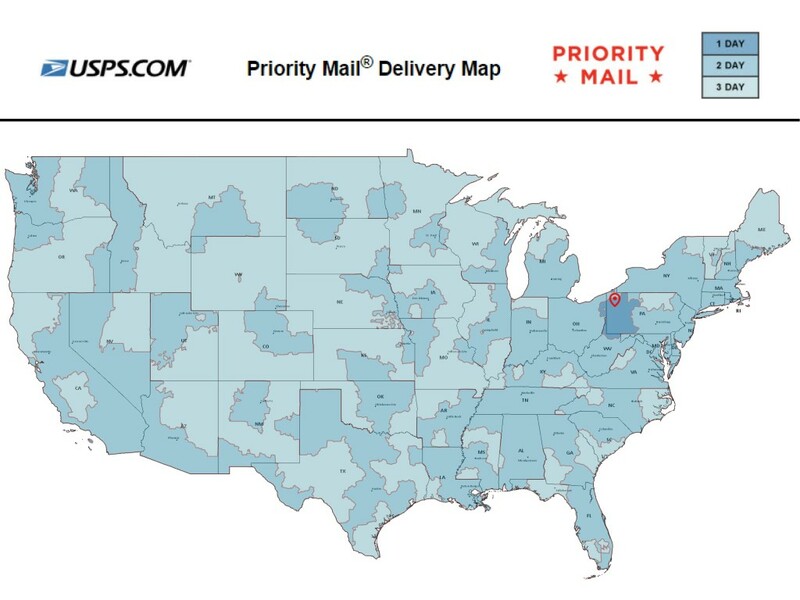 Our products are made in America and we ship from right here in Western Pennsylvania. We decided it was our duty to manufacture and commercialize the highest quality palmitoylethanolamide products in this country to do what little we can to curb the opioid epidemic. Your safety is our top priority. This is why we exceed federal standards and use third party testing methods that go above and beyond. Just enough is never sufficient for us, and we want to ensure that you are getting the safest, cleanest, purest palmitoylethanolamide products available. Before it’s deemed good enough for you, our PEA is tested through gas chromatography mass spectrometry, X-ray fluorescence, fourier transform infrared spectroscopy, optical microscopy, microbiological assay, plus all federally-required cGMP tests. 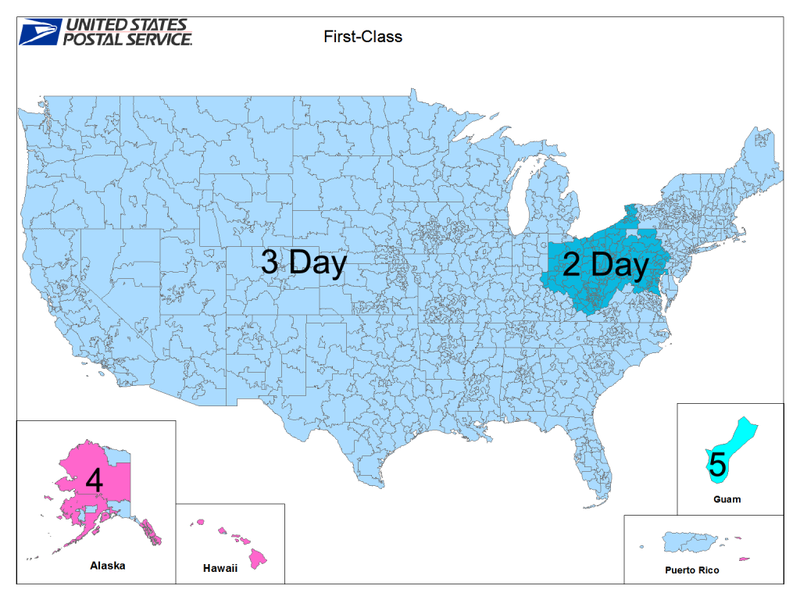 When you buy from us you know you’re getting the highest quality available from a trusted American company, you’ll get your product in a couple of days, and if there’s ever a problem we’ll make it right. Just call our 800 number day or night. Please don’t hesitate to contact us with any questions or concerns you may have.